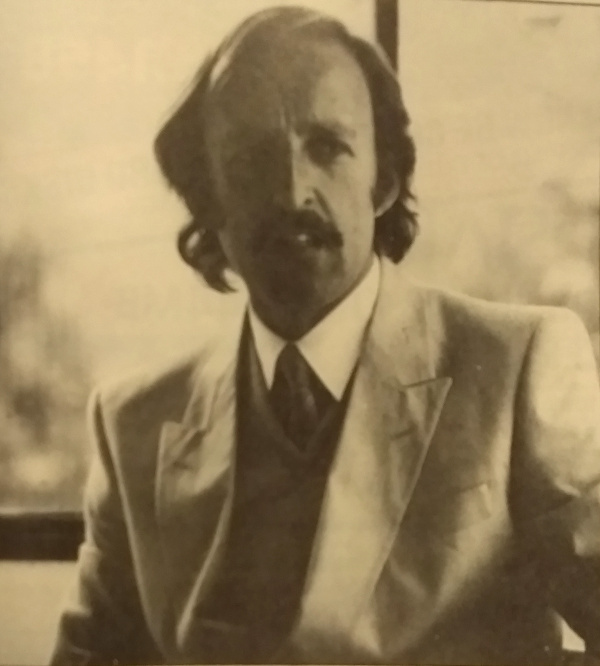 In the summer of 1982, one-time Olympic chess player and former chess grandmaster David Levy, of Intelligent Software - a company best known for producing programs like Cyrus IS Chess, written by Richard Lang - was approached by a "mystery backer" who wanted a rival to the ZX Spectrum, which had only recently been launched. IS was not long-established itself, having been created in the Autumn of 1981 by Levy and Kevin O'Connell. The pair had both started out as professional chess players and writers in the early 1970s, before joining up to form Philidor Press in 1975 when they both realised they were writing most of the chess literature of the day - both Levy and O'Connell frequently contributing to Personal Computer World (Levy in particular writing a whole series on game theory). A year later, after the international chess tournament in Dundee, Levy took a £500 bet at a party in Edinburgh that no computer program would be devised before 1986 that could beat a grand master - a wager, it has to be said, that was slightly less than the $100,000 that had been offered by the Fredkin Foundation of Cambridge, Massachussetts in 1980 for the first program to win the World Chess Championship. This differs from the version of events published in Popular Computing Weekly in April 1984, where Levy was said to have placed a £5,000 bet in 1968 that no computer could beat him at chess within ten years - a wager which was extended in 1978 for another ten years, as at the time Levy had successfully fought off all challenges. David Levy, © Popular Computing Weekly August 1983Levy released his own £295 chess-playing microcomputer in October 1980 with software written by Mike Johnson, winner of the first Personal Computer World Chess Championship, and circuits designed by Barry Savage. Later, the pair went on to develop the SciSys Chess Champion Mk 3, which at one point was endorsed by Anatoly Karpov, and then the Mark 5 Chess Champion which went on to win the 1981 commercial chess computer world championships held in Travemünde, West Germany, and the World Microcomputer Chess Championships in Hamburg. Iain Sinclair, © Practical Computing January 1983The £279 Mark 5 chess computer could play 12 games at once and was styled by none other than Iain Sinclair, brother of the legendary Clive. 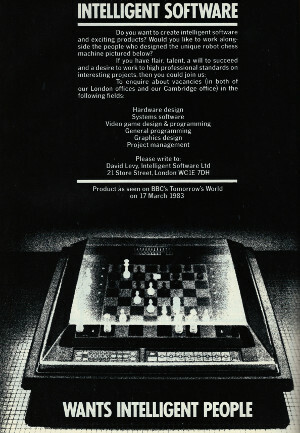 Sinclair (Iain) had been commissioned by Sci-Sys to design its entire range of chess computers, which was a complex task involving the interface between the analogue world of traditional chess pieces with the digital-only microprocessor world. In an interview with Practical Computing, Sinclair, who believed that good design - something which was often overlooked in the computer industry, but which was shared by brother Clive's adherence to the similar principals of "elegant design" - was a fundamental ingredient of a successful project, suggested that "Futuristic design is essential for computer products" and that "People want to feel that they are living in the science-fiction future" but conceded that "Sometimes what is desirable from an aesthetic point of view is not achievable in practice, the limiting factor being either technological or simple economics". Sinclair - who insisted on being paid up front for his design work - went on to design for Acorn as well as its offshoot Torch, although here he came up against economics as a limiting factor, and only part of his design made it into the finished Torch Communicator. He also designed the first digital clock as well as the superfluous turbo version of the Austin-Morris Metro. Meanwhile, IS went on to create a self-moving chess game for Milton Bradley, a Bridge training program for Tandy's Color Computer and developed the La Regence chess program (derived from Lang's original Cyrus) with the backing of a Paris chess-set distributor. La Regence even beat a Cray supercomputer at the ACM Blitz Tournament in 1981. 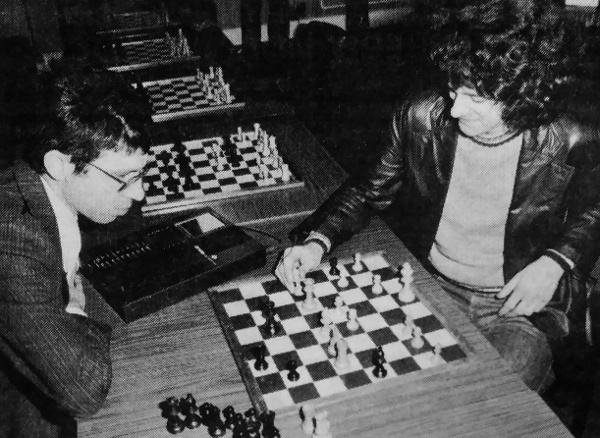 Levy took on a Cray again in 1984, where he played against a Cray MSC - at the time thought to be one of the most powerful computers in the world - and, over the course of two days of the challenge, which was sponsored by GEC/Dragon and was held at Brunel University, thrashed the Cray four games to nil. The event also offered a two-day seminar on Artificial Intelligence, sponsored by Queen Mary College. David Levy, left, looks on as Dr. Nunn considers the Zagorujko chess problem Back in 1982, SciSys's Mark 5 featured in Silica Shop's first Chess Computer Symposium where it, along with two other chess computers which along with the Mark 5 were considered the strongest then available - the Champion Sensory Challenger and the Great Game Machine - were up against human opponents drawn from the South East. Whilst the machines did well, the Symposium revealed that the manufacturers' own ratings were somewhat optimistic, with the manufacturer-claimed playing grade of up to 160 BCF "points" contrasting with the winning machine's 133. 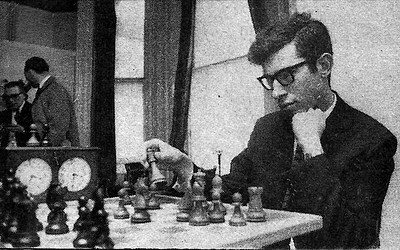 The Mark 5 also became briefly famous when it not only beat the current British chess-solving champion Dr. John Nunn five times out of six, but it also found three valid solutions to the Zagorujko chess problem, which was only supposed to have one. Andrew Page of SciSys said of the occasion that "It shows that chess computers have reached a level of sophistication which makes them essential for organisers of chess competitions, and for chess players who want to verify or analyse matches". More chillingly he also suggested that "There are certain areas of chess in which computers are already capable of deeper analysis than humans. The day of the unbeatable chess computer is fast approaching". The un-named mystery backer was an international finance consortium which had approached Intelligent Software and Domicrest/Domico, a Hong Kong electronics company, to design a machine which, according to Robert Madge, technical director and team leader of the Elan project and director of Intelligent Software "would still be wanted four or five years after the original design decisions were taken" and which should "seduce people in to buying the machine yet say little about the technology". The project, code-named DPC (for Damp-Proof Course), was a Z80A-based machine with 32K of BASIC ROM and up to 3.9M of RAM. It had a keyboard and case designed by Geoff Hollington and Nick Oakley and a custom graphics chip designed by Nick Toop, who had previously studied black holes at Cambridge University, worked for Sinclair and worked on Acorn's Atom. The Elan had an unusually complicated set of 16 graphics modes, which could be mixed together on the same screen. Robert Madge said of this set-up that "I think everyone is going to be a bit bowled over by the speed of the machine's plotting". The Elan's custom chip set was rounded out by a sound chip known as "Dave", developed by Dave Woodfield, which provided 8 octaves of four-voice stereo sound. 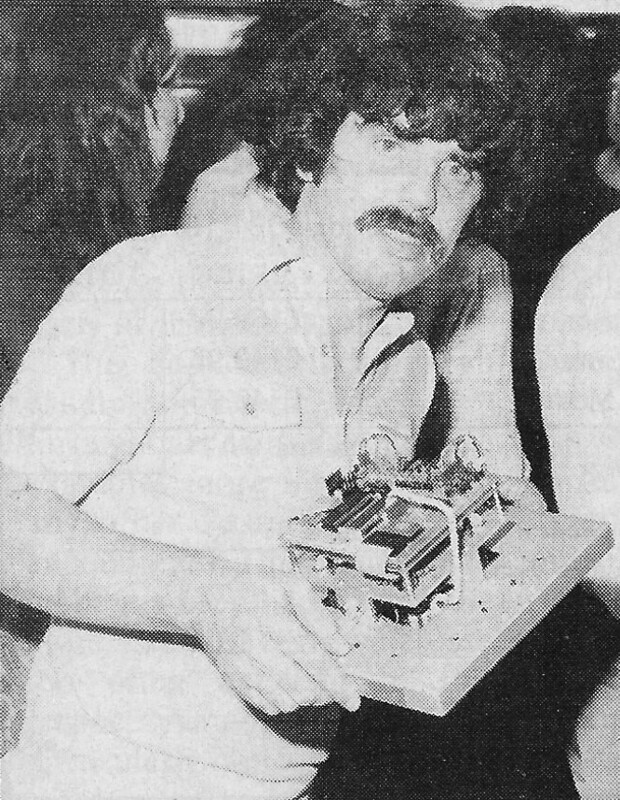 Dave Woodfield, with his 'mouse' Thumper © Practical Computing May 1982Dave Woodfield was already vaguely famous as the winner of the second UK "mouse" competition, from the days when "mouse" meant something entirely different. Set up in 1980 by John Billingsley of Portsmouth Polytechnic from a modified version of a competition first held in New York in 1979, the Micromouse contest challenged small robotic vehicles (similar to Turtles) to find their way unaided to the centre of a maze. Woodfield's entry - Thumper - had won the 1981 contest, which was held in Wembley, with a time of 45 seconds, easily beating the next-best time of one minute 15 seconds, despite Thumper "banging his head against the wall faster than you can say 'heavy metal'", according to Practical Computing. Woodfield's competition included a mouse called Thezeus, built by Alan Dibley and which was driven by a ZX80 with its membrane keyboard sawn off so that Dibley could attach sensors in lieu of keys, along with Nick Smith's Sterling Mouse, which had won the very first UK contest, as well as a competition heat at the Micro Expo Exhibition in Paris in 1980. A variant of Thezeus, called Yetanotherthezeus or T3, won in 1982 at Earls Court, with Thumper nowhere to be seen, however Woodfield popped up again when he was ranked seventh in the 1985 contest with an entry called, appropriately, Enterprise. When it was announced as the first of "a new generation of home computers", the new company remained tight-lipped about details, with O'Connell saying "I have absolutely nothing to say. No information will be released until we are 100% ready. I'm afraid I'm going to continue to stonewall you". A couple of months later, against the backdrop of a worsening home-computer market, what with the recent failures of Atari, Texas Instruments and Mattel and still with nothing tangible to actually show or sell, Robert Madge was still confident about the new machine, believing that it offered the best features from every home micro then available, rolled in to one. He explained "What we were asked to do in our brief was to design a computer which would be among the top few sellers, which would appeal on a whole number of levels - for games, for home business, for enthusiasts and novices and also appeal to commercial software houses who will have to produce material for it". Unlike some competitors - Madge offered the examples of Mattel, Sharp and Dragon - which were churning out me-too boxes, the Elan had been designed from scratch as an entirely new computer, an approach which Madge admitted "[had] considerable advantages and some disadvantages". However, the approach did give Elan/Enterprise a potential competitive edge, as these generic machines often bought in all their system software from companies like Microsoft - a choice which left little scope in the way of customisation, as Microsoft had no interest in modifying or adding features to its well-established Basic. Madge concluded "Most computer manufacturers do not have the experience to design a computer from scratch - particularly the software. It is a weakness of the Japanese and Hong Kong companies.". A micro with an identity crisis: what's in a name? 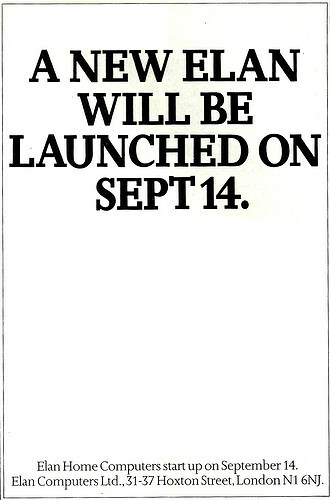 Pre-launch and company start-up advert for the Elan, as seen in Personal Computer News, 23rd June 1983. Hoxton Street is now part of the uber-trendy "Tech City" sceneThe name of the machine proved somewhat problematic. Initially known as the Samurai, this had to be changed after a brief legal tussle when Hitachi subsidiary Nissei Sangyo released a machine of the same name, as distributed in the UK by Micro Networks. Then it was to be called Oscar, Elan and even Flan. Personal Computer News had asked Elan's marketing director Michael Shirley about this particular name change. Shirley replied "Yes. We have signed exclusive distributor deals in 20 countries now and found out that we could not use the Elan name in some of them". 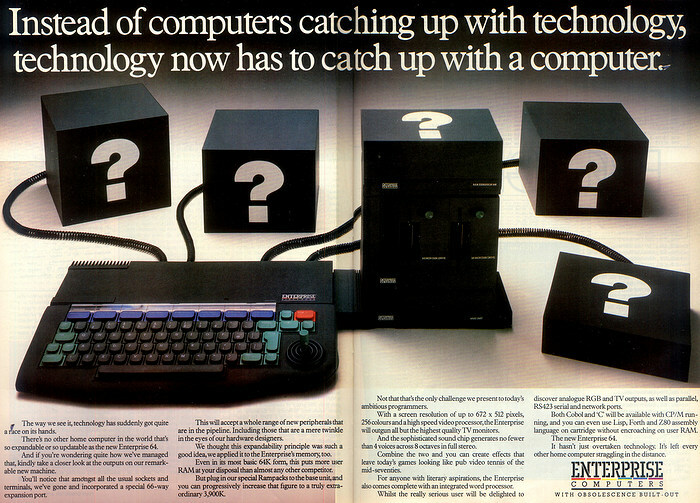 "Some of them" apparently included the UK itself, where Enterprise/Elan had got in trouble with Elan Digital Systems of Crawley, Surrey over the name, only six weeks before the Elan was meant to have gone on sale. Shirley continued "We decided to change the name so that the machine would have the same name throughout the world". When quizzed as to what the new name was, he followed up with "I can tell you that from now on the company will be known as Flan Computers", no doubt said with an especially stern face in order to suppress any potential laughter. The reason for this was given that "well, some magazines have already started to refer to the micro as the Flan Enterprise", which was thought to be a reference to a typo that appeared in Personal Computer World. Shirley had also said in Popular Computing Weekly that "The change from Elan to Flan was the easiest for us to do - some people have been calling it the Flan computer anyway". Coincidentally, Personal Computer World's former Programs Editor, Maggie Burton, was now working as Enterprise/Elan's software manager and was seen manning the Elan stand at 1984's Winter CES in Las Vegas, whilst David Levy and Kevin O'Connel were roaming around scoping out potential distributors. Enterprise had spent £50,000 (£160,700) on going to CES but a working US version couldn't be produced in time so the company had a deserted stand with nothing to show..
Only a few weeks after the change to Flan, the company announced it was set to change again, with Mike Shirley admitting that "We want to come up with a really good name that goes well with the company, and 'Flan' obviously isn't very suitable". Eventually, the company settled on the name "Enterprise", with the eponymous machine being officially launched in September 1983. At the time, Personal Computer News stated that "Elan Computers has launched its £200 wonder micro in the best British tradition. The machine beats all home computers (and many business machines) on paper but won't be available until April". It went on to say "As a micro, its spec is miles ahead of contemporary systems, but then so is its delivery date". Even the BASIC for it, which was being written to ANSI standards and which had lots of additions to support large and structured programs, had been in development for over a year and was not yet ready. The reason for the bespoke Basic went back to Enterprise's wish to not be constrained or limited by taking an off-the-shelf version of something like Microsoft's standard Basic, which most home computers at the time were using a variant of. As Robert Madge explained "We had to have Basic in a very good and enhanced form, with particularly strong graphics and sound - these are the starting point for all independent companies to produce software for it. We [also] had to make sure that, with the Basic and operating-system software, we hadn't closed the door on any future development. We are not crystal ball gazers. Who knows what we may wish to be connected to a computer in the future?". So Enterprise became the first company to implement its own version of Basic, from scratch, to the ANSI standard which had only recently proposed by the American National Standards Institute. Madge said "We wanted a Basic which was likely to be accepted as the standard programming language of the future - a version which would answer most of the objections people make to Basic. In the Elan, I think we have achieved that". When the Elan/Flan did become available in significant numbers in early 1985, around 18 months late (although some early-production machines for sale and review had appeared at the end of 1984) it was up against machines like Sinclair's QL and Amstrad's new competitively-priced CPC 464. The delay in launching was partly down to the constant name-changing but was also because debugging the two custom chips was taking longer than expected. Marketing manager Shirley commented "The debugging of the chips is going painstakingly, but well. We would rather bring out a reliable product in September than an unreliable one earlier". In anticipation of an eventual launch, Enterprise/Elan signed a deal with Welwyn Electronics in March 1984 to produce both machines, including the 128K model which wasn't expected to appear until the beginning of 1985. The deal was expected to create 90 jobs at Welwyn's Tyneside factory, however it appears to have fallen through as by the end of 1984 Popular Computing Weekly was suggesting that the Enterprise was being manufacturered in Perth, Scotland, by GRI Electronics. Meanwhile, Popular Computing Weekly announced the winner of its "Find a name for Flan" competition, with Bernard Dinneen's winner being "Teflon Computers - because they can't find a name that will stick". When the first batch of Enterprises finally arrived in shops during Christmas 1984, they were quickly scooped up with all machines delivered being sold. A spokesman for John Menzies, the Scotland-based newsagents chain said of their trial of the Enterprise that "We're pleased with the initial interest shown, however we have to see what customer response is in the long term before we can make any sort of commitment". WH Smith was also testing out the market for the Enterprise and reported that it would decide at a later date whether to add the machine to its range. Caroline Jones of Enterprise said "From the feedback we've had the Enterprise sold out within days of it appearing in a limited number of shops". Intelligent Software recruitment advert, © Personal Computer World, September 1983After the initial flurry of excitement, sales were slow, partly because the machine was no longer as groundbreaking as it would have been had it been launched on time in 1983 and it was £50 more than its previously-promised magic price tag of £200, but also because the competition hadn't exactly been standing still either. There was also the problem that a very limited amount of software was available at the time of launch, with only four software packs written entirely in BASIC being available. Enterprise's Mike Shirley seemed to conceded that this was not ideal, saying "obviously we will be doing a wide range of machine-code games later, but at least we're getting some out". Shirley also suggested that the fact that the games were written in BASIC was actually a bonus as it enabled the user to "break into the program[s] to see how they work". Despite the significant lack of launch software, it was hoped that the launch of 14 new software titles in Spring 1985 would help, with negotiations under way for more titles with some of the big software houses, such as US Gold, Firebird and Ocean (Enterprise hoped to have a 100-title range by the following Christmas) and there was even to be a game based on the latest James Bond - A View to a Kill. The game of the film, designed by Speshal K and released by Domark, was the first time that Bond had ever (at least officially) been the star of a computer game. Intelligent Software itself was also due to release twelve programs under the "Enterprise" label in the February of 1985, including, not surprisingly a chess game, as well as an assembler/disassembler, programming languages Lisp and Fourth and various games. Production of the Elan/Flan/Enterprise at this point was running at a rate of "several thousand a month", although Shirley admitted that the company was not yet up to full-scale production. He said "We've made substantial progress in a difficult time of year. Against the market background we've done extremely well". A month before, Shirley had also claimed that Enterprise was coming out with "eight titles a month" and that the company was aiming to grab 10% of the market - or more than 150,000 machines - by the end of 1985. When the 128K model was finally launched in the week of 23rd May 1985, the price of the original 64K model was dropped to only £180 (£550 in 2019). Sales of the 64K machine had so far been "just under 10,000" with the company optimistically predicting combined sales of 150,000 by Christmas with an additional 200,000 being sold abroad. Enterprise's Shirley said "I don't believe there is anything around to challenge us on quality and price - it's going to be a 128K Christmas. It significantly out-performs machines such as the BBC B Plus and the QL at almost half the price". Almost half the cost of the BBC still put it in the high end of the market, with Popular Computing Weekly suggesting that it was "too high [a price] to cause much of a stir". The price drop of the 64K machine was welcomed though, or as John Cochrane wrote in his review of the Enterprise 128 "perhaps the best thing about the launch is the price reduction on the existing 64K model. For £180 the Enterprise 64 offers better sound, display and programming capabilities than almost any other computer in a similar price range". He continued however with a somewhat damning "Both Enterprise models suffer from a lack of software at present and until such becomes available, it is difficult to justify the cost of the 128K model". Despite the price cut, the predicted massive surge in sales didn't happen and it didn't help much that by September 1985 there were all-out price wars in the 128K market: Commodore had dropped the price of its CBM128 to £269 (£820) - not forgetting that the 128 had the huge advantage of having C64 compatibility which meant there were in excess of 6,000 software titles available for it - and Amstrad had just released its new CPC 6128 "battering ram", which retailed for only £300 (£910), only £31 more than the Commdore, but that was for a package which actually included a disk drive and monitor. By the time the Personal Computer World Show rolled around in September, the 64 Enterprise was nowhere in sight. An Enterprise representative on the stand told Popular Computing Weekly that "Frankly, the 64K machine simply isn't in demand". On the upside, Enterprise was showing off its ExDOS disc controller, which gave the Enterprise 128 access to any floppy disk drive that implemented the Shughart 410 interface, be it 3", 3.5" or 5.25", even in MS-DOS formats. By the end of 1985, Enterprise was looking into the idea of bundles or more price changes to its 64K and 128K machines, as it admitted that there had been problems getting its machines into shops. These problems were exacerbated when shipments were halted by distributors Terry Blood Distribution. Mike Shirley summed up Enterprise's dilemma when he suggested that "it's an interim thing. TBD had difficulties distributing the product because we were not going into the major multiple stores. The independent retailers also found it difficult to market a product that was not stocked in the High Street". Shirley continued "We have proposals for the New Year", a nod towards a meeting for fresh discussions with TBD at the beginning of 1986, and "[there is] new hardware we are working on. 1985 has been a difficult year. The High Street is selling more and more of the hardware, and we must devise a strategy to get into those multiples". Despite the problems, the Enterprise still got some good, if reserved, reviews, including Personal Computer News' verdict which said "A year ago the Enterprise would have stood out as a market leader. Today, with Sinclair, Acorn and Commodore and perhaps MSX all becoming household names, it will probably have a much harder time making an impact. Even so, it's not a bad machine. The Basic, for all its length, is extremely good and should prove easy to use, especially for the beginner". Enterprise's Technical Support head Steve Groves defended the machine against some of its critics, including that of Andrew Pennell's otherwise-largely-positive review in Popular Computing Weekly, when he wrote "We were sorry to see that Andrew disliked the Enterprise keyboard. Opinions vary - it's largely a matter of personal preference. To date we've found users' comments encouraging - perhaps he will find that familiarity will improve his opinion". Groves was also keen to reinforce that the company was taking software seriously, stating "The success of any home computer manufacturer is dependent upon the software available. The Enterprise offers tremendous opportunities to programmers and software houses have been quick to realise this. We are currently working with several major software houses to produce new programs and convert existing ones". It was not to be though, and by the summer of 1986, Enterprise had racked up debts of around £8 million. It was liquidated shortly afterwards. Just before its collapse, Enterprise had been working on prototype for a follow-up to the Enterprises 64 and 128. Called the Vulcan, it was to have been both CP/M compatible and backwards-compatible with the two previous Enterprise micros. With 320K RAM as standard and running the Z8000 processor, the £400 machine would also come with a 3.5" floppy and a monitor, as well as a bundle of software including Supercalc. It never saw the light of day. Nine months after Enterprise folded, it looked like it might return from the dead. After it collapsed, its assets had been bought by Indian company Broadlight, before it was sold on to a German company, with which former Enterprise executive Neil Blaber was in talks to act as the UK agent to sell software, peripherals as well as actual Enterprise computers. Blaber was quick to point out that "Enterprise is not officially moving back to the UK yet, but it might be", before going on to suggest that the price of the machines on their return to the UK would be "competitive", at around £60 for the 64K model. David Levy continued to write books on games, AI and robotics, accumulating 50 titles to his name, as well as founding Computer Olympiads and becoming president of the International Computer Games Association. He became chairman of Beeston, Nottinghamshire-based Retro Computers, a company which counted Clive Sinclair among its investors. Retro launched the Sinclair Spectrum Vega in 2015, a new crowd-fund-developed version of the Speccy - the very machine that precipitated the development of the ill-fated Elan - but with 1,000 games built in to its ROM and no Microdrives in sight. Although it has no keyboard, there's a nod towards the original Spectrum design with the inclusion of five Spectrum-style rubber controller keys. David Levy said of the rationale behind the machine that "because we are providing 1,000 games in the Vega we expect that our product launch will also be extremely popular with many computer games enthusiasts who have not yet experienced the joys of the Spectrum, but at a tiny fraction of the cost of building such a vast games collection in the 1980s. We therefore believe that the Spectrum community will grow and grow as more and more games enthusiasts acquire a Vega.". The average cost of cassette-based computer game in the mid-80s was around £5, so such a collection would have cost a not-insignificant £16,000 in 2019 money to acquire. The much-delayed follow-up, the Vega+, has since become mired in controversy.